The Inspired Wren: Announcing the Crochet-Along Afghan Sampler! I am going to crochet a contemporary afghan sampler over the course of the year to be finished in time for Christmas 2015; perfect for giving away or cuddling under. And I'm going to make it up as I go. Join me! 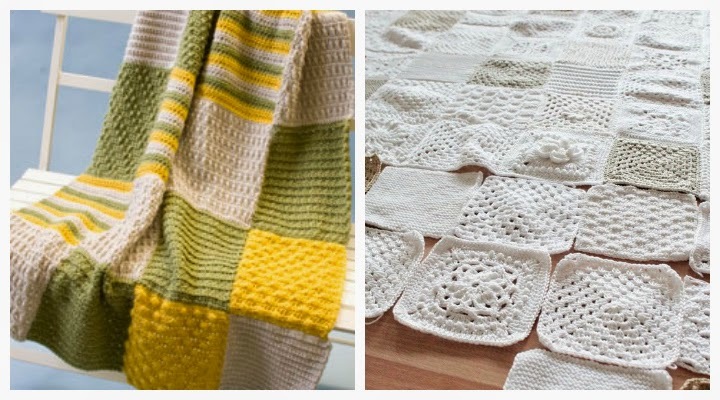 *You may also opt to make a monochromatic afghan, one color is also a lovely look. OR maybe you want to go multicolored and use ten, or even twenty, colors. The choice is yours; I'll be working tri-color (but the image below makes me want to do a monochromatic one at the same time). The schematic below is the plan I will be using to be sure the stitches compliment each other and that we are working in the correct colors. 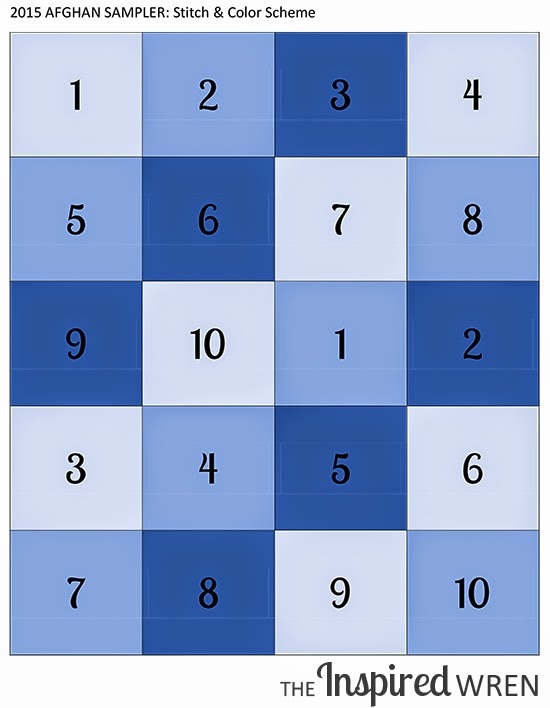 On the last Tuesday of each month I will announce the Square of the Month and instruct you on the stitch- and row- counts to achieve your two 9" squares. I'll also let you know which two colors you'll need for the month. Soon, you'll see a new Crochet Along tab at the top of the blog where you can find all the information about the 2015 Afghan Sampler in one place. The numbers here indicate the sample-stitch or Square of the Month, and the color illustrates a tri-color layout. Ready to get started? You'll need a color scheme and yarn. Have I mentioned I'm making this up as I go; this means I'm am making my best educated guess as to how much yarn we will need. I believe we are going to need two 6 oz (or 315-yard) skeins of each color, for approximately 12 oz (or 630) yards of each color (based on the amounts needed for this sampler). Personally, I am starting with three of each to be safe: Caron Simply Soft in Grey Heather (Color A), Light Country Blue (Color B), and Country Blue (Color C). Edited 2016: The final sampler used three 6 oz (of 315 yard) skeins of Colors A and C, and four 6 oz (of 315 yard) skeins of Color B. I used Caron Simply Soft [affiliate link] in Grey Heather (Color A), Light Country Blue (Color B), and Country Blue (Color C). Now go out and get yarn -- gather up those coupons, find the sales, spin some wool, trade your best work, whatever it takes. Then hook up your two January Squares and meet me back here on February 24th for Square 2. Of course I can never not brag about my work in progress, so if you need a sneak peek I'm sure you'll find one on Instagram (or Facebook) under the #afghansampler hashtag. Looking for the rest of the squares? Click on the Crochet Along tab a the top of this site! Other questions? Size? Rows? Border Count? Visit Frequently Asked Questions! 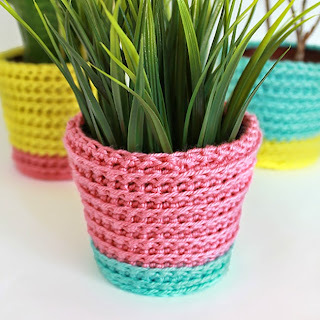 PS -- If you finish your squares for the month and need another project, be sure to check out these crochet planter covers; quick little projects that don't take a year to finish, unlike a certain sampler afghan. From my marathon sewing sessions, to all that I do when I #shouldhavebeensewing catch daily updates on Instagram (and Flickr) of works-in-progress. 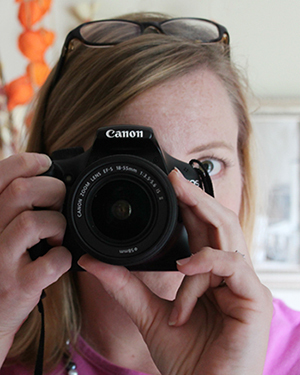 Get that behind the scenes view you’re looking for, and sneak peeks of First Tuesday Tutorials, too. How fun is this. I wish I knew how to crochet. I have tried learning a couple of times but never managed to figure out how to get past the chain stage. Knitting is no problem, but crocheting has always stumped me for some reason. Ha! I'm afraid of the learning curve to knitting. May I suggest, skip the chain stage and learn a foundation row stitch instead. YouTube taught me Everything I know! Fantastic! What a fantastic idea! I love the monochromatic sampler pictured! I really love your project and i will follow you. Your colors combination is nice, i like it! 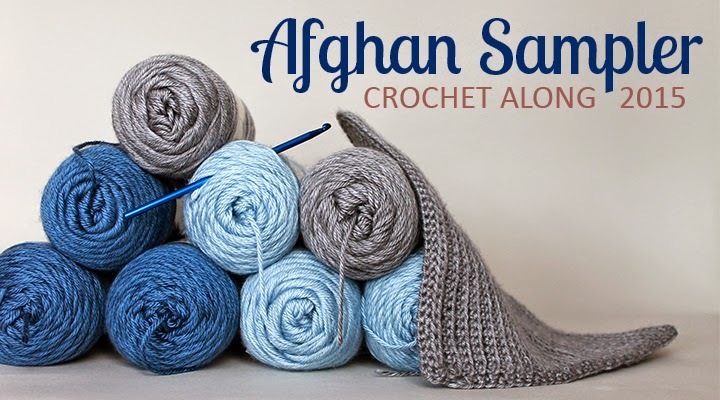 This looks like fun :) I'm looking for a CAL that makes something larger than an afghan. Would it be difficult to turn this into a queen size blanket? Maybe by making each square larger? Ooh! Fun! You could could make each square larger OR you could just make more squares. A quick Google search informs me a queen throw should be about 60" x 80" for top of mattress only, or 90" x 100" with drape. So that's a LOT larger than the lap-/baby-size blanket I'm creating here. More squares would look more proportional to the all-white blanket above. I would just break out the calculator and work the math depending on which look and final size you envision. I'd love to hear how it goes if you decide to work it up! I was thinking of making bigger or more squares too! Did anyone ever end up making a bigger blanket? I really shouldn't start another crochet project but I can't resist, I'm in. Now just to play catch up! I've almost finished my first square! But how do I get 38 stitches along the side when there's 55 rows? When I look at the side of this square I find it's easier to count the ridges, or space between the ridges, than the actual rows. I count 27ish of those spaces. If I were to single crochet in two spaces, then 2 sc in one space -- I'd be placing 4 stitches every 3 ridges and that would get me up to 36 stitches when worked along the 27 ridges. Then I just need to sneak 2 more stitches in (not right next to each other, maybe at each end?) and that would equal 38. So I figure the math to spread the stitches out as evenly as I can, then I fudge the balance (in this case those last 2 stitches). Anyone else have a better solution, or explanation, for Anne? YAY! This kind of spreading out of the stitches along the borders keeps happening on each of the squares. If you need help again, let me know. But now you know how I muddle through it. With regards to the order count, I myself did two sc in first space after the chain one,then one sc in next two space. I repeated that until the end and it worked out nicely... so love the feel of the square! just started yesterday with this cal =) so excited! When looking at the square, each ridge is created by two rows. The number of rows are not as important as the 9" x 9" measurement and the 38-stitch border on each side. When measuring, keep in mind that this stitch can seriously stretch, so be sure you don't pull on it/stretch it to get to the 9", just let it grow to the 9" on its own. Also, check out the Square 4 post for a great way to keep count of rows with stitch markers! I think you'll be okay if you do as planned and keep your tension the same throughout. I admit I crochet tight. It's not important to match my squares exactly as long as your own squares match each other. Keep working 10 x 10 and you should be fine! You'll just have a slightly larger finished blanket -- and it will be lovely. Is January the only square shown? Click on "Crochet Along" at the top of the blog (or under the menu on a mobile device) and you'll find the squares as they're published. Hi Ren, wonder if you can help - my square is a rectangle! At 38 stitches by 55 rows it's far longer than it is wide. Any ideas?! I just logged on to check the same thing - I've used 38 stitches but I'm stopping at 40 rows because I've already reached a square. I'm using a different type of yarn, so hopefully that is the only reason. Fingers crossed it won't affect future squares. I'm hoping the square is more important than the number of rows.... Cath. Cheri, I will not be emailing out the Sampler Afghan. Later this year (2016, time still undecided) I plan to put the entire Sampler Afghan into one pattern file available as a PDF download for a small fee; the original posts for each month will remain here on the site for free indefinitely for you to reference. Thanks for understanding. Hi Ren, any chance you have that PDF pattern file? I'd love to make this! Be careful you don't pull up on this first square, it can stretch upwards quite a lot. But if you've reached 9" without stretching, definitely stop there. The more important part is that there are 38 single-crochet stitches around each edge of each square here and on all the squares for the afghan. Me too if this is a possibility? 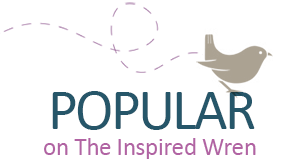 I just found your blog and want to start this project. 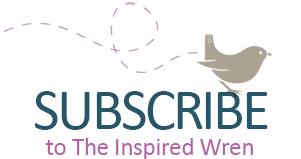 I was going to just read the blog posts, but if you are emailing the pattern also I would love that. If not, that's okay too. Thanks! Melissa, I will not be emailing out the Sampler Afghan. Later this year (2016, time still undecided) I plan to put the entire Sampler Afghan into one pattern file available as a PDF download for a small fee; the original posts for each month will remain here on the site for free indefinitely for you to reference. Thanks for understanding. I totally understand, thanks! Was just thinking that since it was a work in progress, there might be a final copy with all the edits. I would certainly pay for a final copy of the PDF. Let me know? Ok so clearly you didn't measure as you went either. 38 fsc = 11.5 inches, not 9 inches, 30 fsc = 9 inches. And there are 3 sc rows in 1 inch so the math there doesn't make sense. This pattern almost doesn't make any sense. I think you need to go back and re-count your ch and rows and remeasure. Looks fun tho. 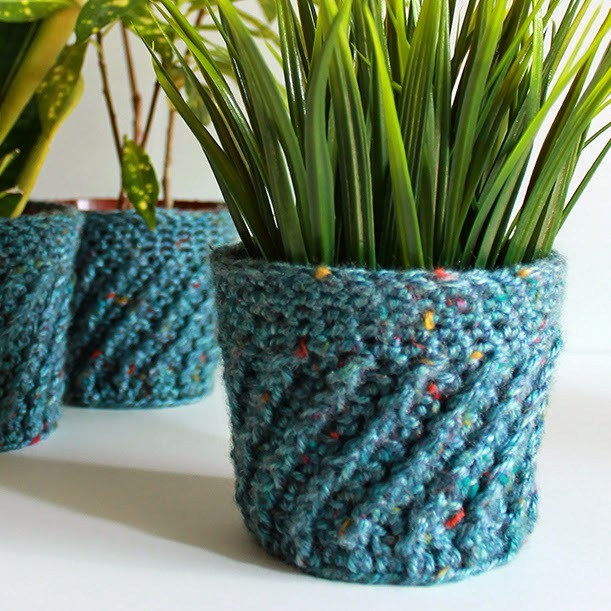 Depending on how tight or loose you crochet, it will be slightly different. The author obviously has written it correctly as many people have successfully completed it. Read some other replies... you may have to adjust your number of rows depending on type of yarn used, size of hook and each individuals tension. Be thankful she is willing to share her beautiful pattern. Hi Ren, I just found this a few days ago and fell in love with the picture of it! I have a question about the January square. If it's 55 rows how do you only get 38 sc down the side? You just dec a couple together randomly? Mine is going to be 11" (I think) as I went up a hook size...I want it to be a little bit bigger. I love this and am working my version up now. However, I am a bit confused with the border directions on the January square. If the block itself is 55 rows x 38 stitches, why am I only making "38" sc's on all sides to create the boarder? I'm sure there's a method, but I'm lost. Thanks in advance. All squares will end with 38 sc on each side regardless of the stitch used. It is the constant that will allow you to put them all together at the end. The joys of doing a sampler with a variety of stitches. I did alot of frogging to get it right. I wish I could remember how many I ended up doing, but if I remember correctly it was similar to 2sc then skip 1. That causes a "decrease" of sorts. Hope that helps! Beautiful afghan! Thank you. I will make mine a bit larger, and already have a few squares of random stitches. I am going to use some of yours now. Thank you for the sc edging plan...I had not figured out yet how to make them all fit together. God bless!! I am just starting this afghan and I'm excited to see it finished! My tension is looser than yours so I am adjusting things as I go to make sure it all comes together beautifully. 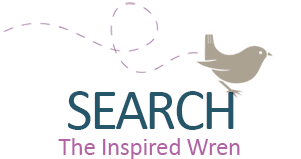 I will post the finished project on revelry to share when I'm done. Thanks for the beautiful design! I have also started this 2015 CAL, and am having trouble with gauge. My first Square, with the specified number of stitches, was 11"! My question is this. Is it more important to have the right number of stitches, or the correct size? I started out using Red Heart with Love and a 5.5 hook. I would realy apriciate this. Hi! I would love to make this afghan (sampler 2015) where can I print the whole pattern?